Come January 10th, there will be a whole new way to bombard your Dust enemies. 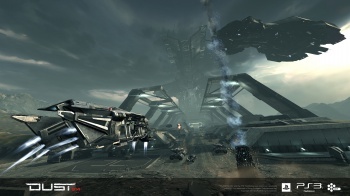 Dust 514, the planet-based companion game to space opera EVE Online, has until now been entirely separate from its sibling, but that's about to change. As of January 10th, the two systems will merge, and EVE players will get to play in the same sandbox as Dust, or vice versa. This brings with it a number of new options, among them the chance to bombard your Dust foes from space. Tactical Strike is the first option on the menu, introducing long-range, high precision explosive munitions launched from orbital platforms at hapless ground targets. Faction Warfare may be of more interest to EVE players, in that it helps them take over planets by backing ground-based mercenary factions. "It is of course very important that we do not upset the serious business of internet spaceships," says spokesman CCP Nullarbor, and that means the ISK economy will be on a form of lockdown even after the merger. There will be no ISK transfer between Dust mercenaries and EVE players, at least for the moment. That block won't last forever; just until the game economies have reached some sort of equilibrium. For more information, check out the full post here.